ATLANTA, July 21, 2018 – Nine days of world class tennis started on Saturday morning as the skies parted at Atlantic Station for the 2018 BB&T Atlanta Open. The main draws of singles and doubles were also released on Saturday. 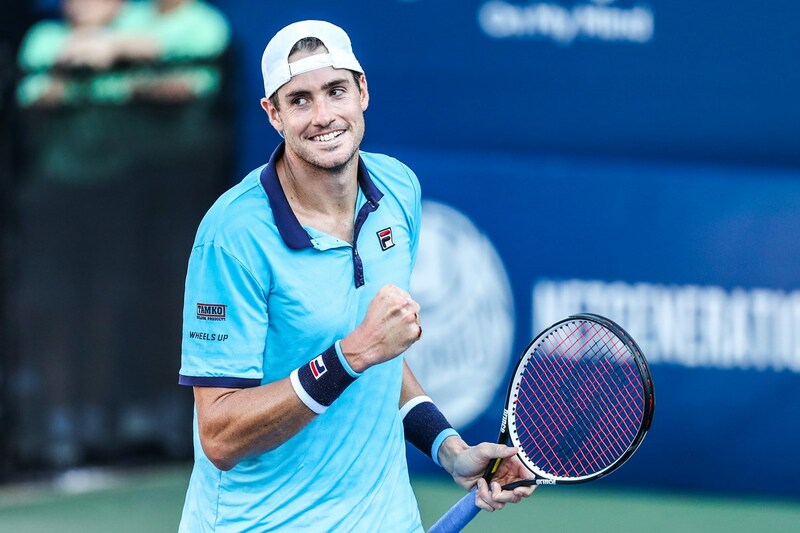 As expected, four-time BB&T Atlanta Open singles champion, John Isner is the top seed. Isner is a former University of Georgia All-American and NCAA National Champion. He is currently ranked No. 8 in the world by the ATP World Tour after reaching the semifinals at Wimbledon. 2016 BB&T Atlanta Open champ, Nick Kyrgios of Australia is the No. 2 seed. Other seeded players include: Hyeon Chung of Korea, Matthew Ebden of Australia, Americans, Frances Tiafoe and Ryan Harrison, along with Jeremy Chardy of France and Mischa Zverev of Germany. In doubles, 2018 Wimbledon Gentlemen’s Doubles champ, Mike Bryan will be teaming with Tiafoe. This should form a fun combination and the American duo will take on American Jamie Cerretani and 45-year old Indian, Leander Paes, who won a bronze medal back at the 1996 Atlanta Olympic Games in singles. Main draw singles and doubles plays starts Monday. The four players who win their final qualifying match on Sunday will earn a spot into the BB&T Atlanta Open singles main draw. Kiranpal Pannu, a player at Columbus State, who won the BB&T Atlanta Open Wildcard Playoffs fell in a hard fought match to Thanasi Kokkinakis of Australia. Tommy Paul and Alex Bolt also claimed victories over Bernard Tomic and Garrett Johns respectively. Paul started off extremely strong with big lead and held on to take a 6-4 first set. Paul showed laser like focus and kept a strong serve heading into the second set. The Australian, Tomic, was not going to go down without a fight. Tomic started frustrating Paul with his forehand and return of serve. He was able to close out the second 6-4, forcing a decider. In the end. Paul seemed to regroup as the third set started- turning frustration into determination as both players help until midway through the decider. Paul’s serve was the big difference in the match as he totalled 11 aces. Paul made the quarterfinals last year in Atlanta, and he says he’s here to make another deep run. Bolt came out ready to play. Jumping to a big lead over the local wildcard that is finishing up in high school career in Johns. Johns seemed to pick up the ball better as the match went on against his much more experienced opponent. He may have fell in defeat, but Johns put up a great fight in the second set. Other day one qualifying winners include Denis Kudla, Jason Jung and Poland’s Huber Herkacz. How: Tickets at the gate or reserve at www.bbtatlantaopen.com.